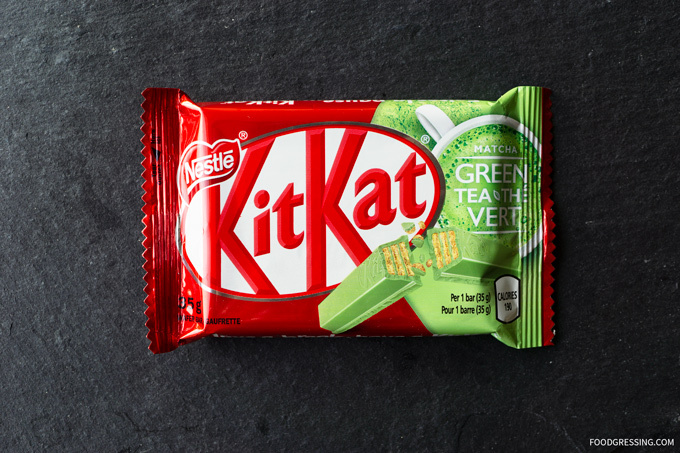 Did you know that Nestle Canada has its own Kit Kat Matcha Green Tea flavour? I had previously reviewed Green Tea Kit Kat Mini Bars produced Nestle Japan, so it was interesting to see how this matcha green tea flavour compared. The official description of this particular flavour is that it’s a classic, crisp Kit Kat wafer covered in a smooth matcha green tea coating. 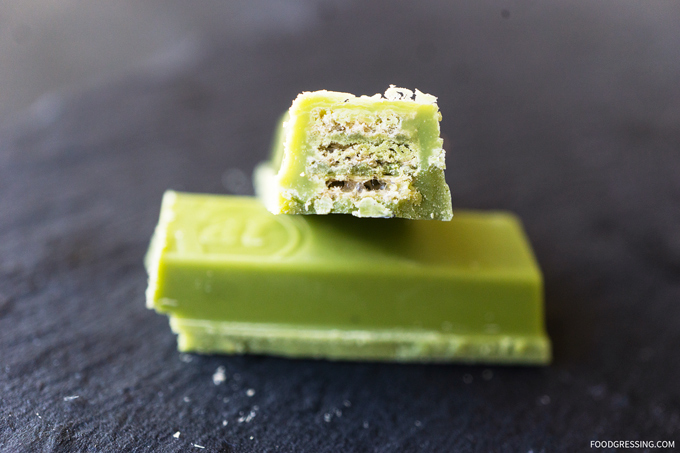 It’s made with real matcha green tea powder, all natural-flavours and no artificial colours. Each 35 g contains 190 calories which includes 11 g of fat, 5 mg of cholesterol, 35 mg of sodium and 2 g of protein. 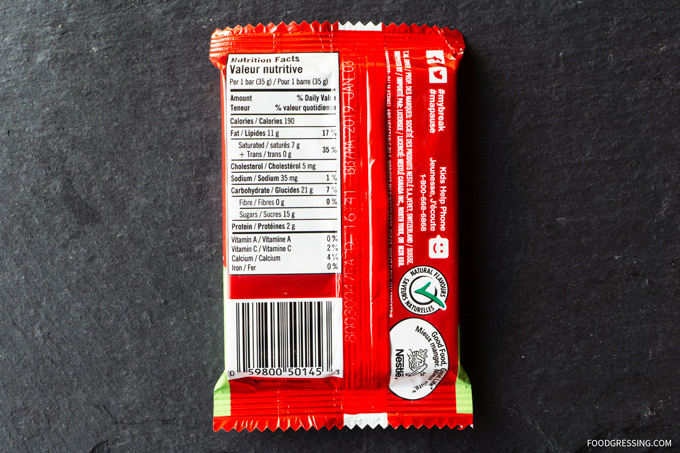 The matcha green tea bars have a light green outer coating as noted in the official description. The green colour is about the same as the Japanese version. 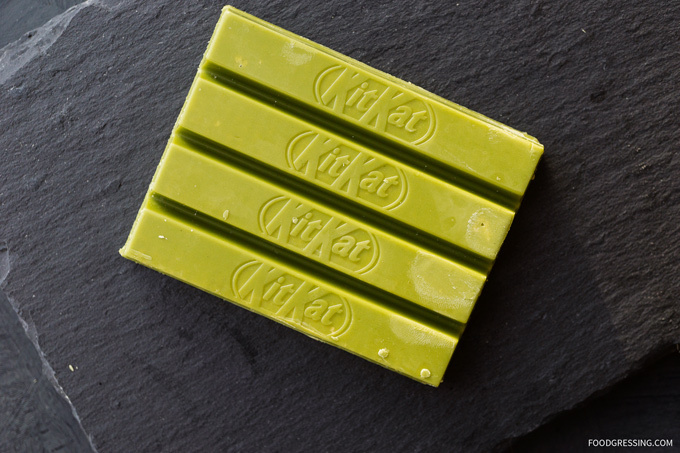 When I did a cross-section of the bar, the Kit Kat wafers appeared to be separated by a layer of what likely is white chocolate flavoured with matcha green tea. I found this Canadian version of Matcha Green Tea Kit Kit to be a lot less bitter than the Japanese one. In fact, after researching online, that seems to likely the case based on an article in the Huffington Post. In Japan, there are two versions of Green Tea Kit Kits: the standard flavor that you’ll find all over Japan, and a less bitter version that they sell only at Japan’s airports to appeal to foreign taste buds. For me as a matcha lover, I definitely prefer a more authentic taste – that is, with a slightly bitter aftertaste.